Bellatrix, I'm a Pug! : Flat Spencer? I got home from daycare today and found this in my mailbox...a flat Spencer! Puglet sent this to me in the mail to help with my "weight issue". It's soooo amazing! 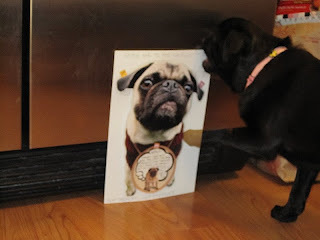 Spencer is my bestest buddy in the whole pugverse, so having him on my fridge will help me to say no to that extra treat. Spencer helps me keep in shape too, we try to always have Saturday play dates in our secret park, and he always is willing to chase me around. Mom said I can't eat flat Spencer, and trust me I have tried to nibble on him. In fact, I think he's almost as yummy as the real Spencer. I know that with all this help I will be my svelte self once again...or at least I have a cute picture of Spencer to cuddle with. I'm really glad you like Flat Spencer. I was going to send you something yummy, but my human said yummy = tubular so... yeah. thanks soooo much for my Spencer. It must be that I know he's my best friend, but he doesn't scare me at all! I actually started to play bow at him and was wagging I was so happy. Mom and dad had a huge laugh over it. It's so nice to have a friend in the flat form when I don't have my Spencer handy to snuggle with. thanks so much Puglet, you're so sweet. Whoa! Thank you Puglet for sending Bellatrix a photo of me! That's so awesome. I am so happy to see Bellatrix is enjoying my company when we can't actually be together! I love this! I think that is awesome! I wish I had a flat Murphy around to swoon over. Spencer I love love love my flat Spencer, but not as much as I love the real Spencer. Bellatrix, you make my curl so much more curlier!